Why are congressional staffers threatening faculty? It’s very simple: members of Congress and their staffs should not be in the business of threatening faculty members. Why does this need to be said? It happened last week. Join 1,000 faculty members who’ve already taken action and sign an open letter standing strongly against this kind of behavior by powerful legislators. Here’s what happened. Ari Kohen, an associate professor of political science at the University of Nebraska–Lincoln, came across this photo on a progressive blog’s Facebook page. He hit “like” because it amused him, and moved on with his day. 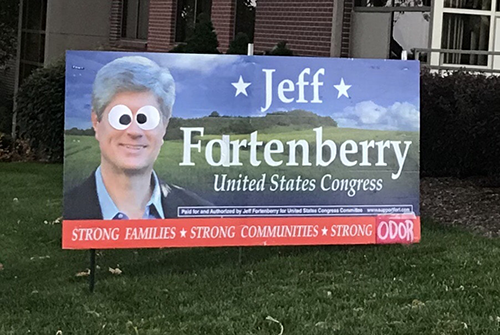 Later that week, the staff of Nebraska congressman Jeff Fortenberry’s office combed through the names of people who’d liked and shared the photo. Then the chief of staff to Fortenberry, Reyn Archer, made a 53-minute call to Kohen to lambaste and threaten him for exercising his well-established right to free speech. He not-so-subtly implied that he could use his position and power to bring down a rain of harassment on Kohen. “We have a First Amendment opportunity to basically put you out there in front of everybody…we could do that publicly, would you like that?,” said Archer in the call. Archer also contacted Kohen’s employer. Sign the open letter to Congressman Fortenberry. It should go without saying that a legislator and his staff should not harass and threaten a faculty member based on his or her social media activity, and that it is absurd to equate “liking” a Facebook joke with support for vandalism. However, it’s clear that, in the current political climate, this DOES need to be said. We’re calling on Fortenberry to publicly repudiate his chief of staff’s actions to threaten and harass Professor Ari Kohen, and to stand unequivocally for academic freedom and free speech for all faculty. Categories: announcements, comments | Tags: Facebook, First Amendment, political science, social media activity, University of Nebraska-Lincoln | Permalink.